Exchange 2010 Active Sync Issue - YaBo ! I’ve spent the last few days migrating to Hyper-V, SQL 2008, Windows Server 2008 R2 and Exchange 2010 from 3 machines – Windows Server 2003, SQL 2005 and Exchange 2003. The last thing I had to turn on/get going was Active-Sync for syncing mail with home via a mobile device. This failed miserably, as per the below event log on my Exchange 2010 Server. 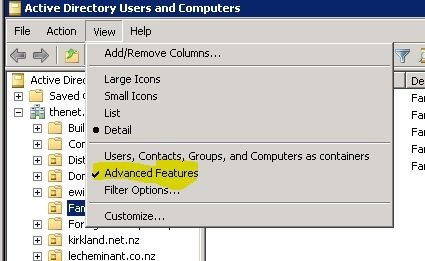 Exchange ActiveSync doesn’t have sufficient permissions to create the “CN=<name>,OU=<OU Name>,DC=thenet,DC=gen,DC=nz” container under Active Directory user “Active Directory operation failed on <server>.thenet.gen.nz. This error is not retriable. Additional information: Access is denied. 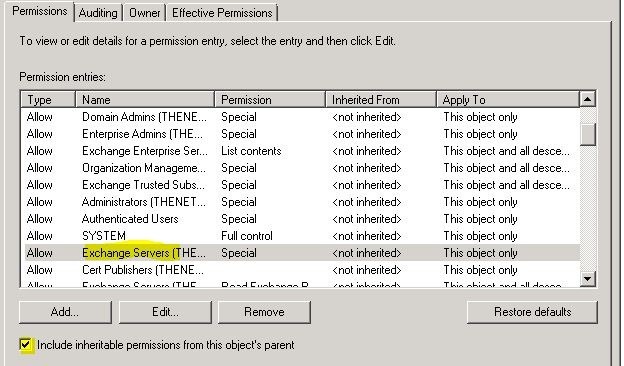 Make sure the user has inherited permission granted to domainExchange Servers to allow List, Create child, Delete child of object type “msExchangeActiveSyncDevices” and doesn’t have any deny permissions that block such operations. <Data>Active Directory operation failed on <server>.thenet.gen.nz. This error is not retriable. Additional information: Access is denied. The work around was pretty simple, however took me some time trolling through external and internal Knowledge Base Articles. I came across this article, however it didn’t seem to address the issue. Select Exchange Servers, and tick the Include inheritable permissions toggle then Apply and OK. This issue is currently bugged and is likely to be fixed with an update in the future – It seems to be a symptom of ‘upgrading’.